When I read the line above taken from the journal of the great Canadian artist Emily Carr (1871-1945), it really hit close to the bone for me. I thought about my early forays in my youth when I believed I wanted to be a writer. I loved the words and their power, their ability to create emotion and reaction in the mind of the reader. But I cared little about creating narrative, about the details, the nuts and bolts, involved in storytelling. It was the essence of things that interested me, the atmospheres of silence and distance and empty space. It was all too heady for an uneducated and inexperienced kid. I didn’t know what to do with writing that evolved into what seemed to be ethereal nothingness. More and more, it became a frustrating exercise. And I think that is where painting came in for me, at a time when I truly needed it. I found that painting, especially landscape painting, was less about narrative and more about that essence, about capturing moments of atmosphere and perceived emotion and spirit. 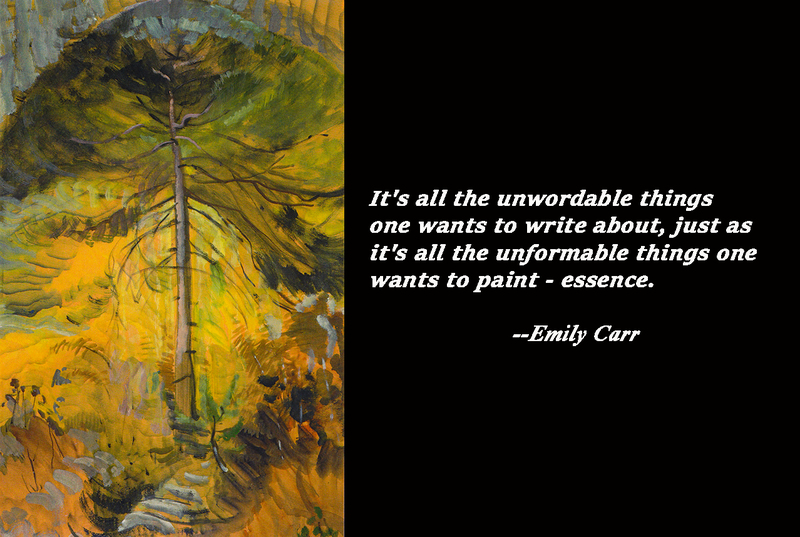 The unwordable and the unformable, as Emily Carr put it. I definitely see this evocation of essence in the work of Emily Carr and can only hope to find the same in my own. Fortunately, you became both a writer and a painter. I totally enjoy hearing your thoughts, being a receiptiant of your life experiences and gathered knowledge. I say a silent thank- you to you with every post.